Most recently, Giovanni Bisignani was Director General and CEO of IATA (International Air Transport Association) a post he held until July 2011. 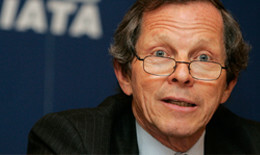 During his time with IATA, Bisignani played a key role in reshaping the aviation industry and its governance. In 2004 Bisignani introduced ‘The Simplifying the Business Initiative’, which modernised the industry by improving customer convenience and reducing costs. He publicised the work of IATA, using advocacy and lobbying in order to ensure the government focused on long-term issues for aviation. He has a particular interest in the environment, driving the industry to achieve carbon neutral growth by 2020 and to cut aviation’s carbon emissions in half by 2050. Previously he has served as CEO of SM logistics and Alitalia Airlines, Chairman of The Association of European Airlines and launched the European travel portal Opodo, serving as the company’s CEO. Bisignani is currently on the Board of Directors of Aircastle Limited. In his early professional years Mr Bisignani worked for ENI and Istituto per la Ricostruzione Industriale – IRI. Mr Bisignani graduated from the Sapienza University of Rome and later completed his studies at the Harvard Business School.